Nichol Elaine Imm was born in Denver, Colorado on February 24, 1974. It was the best birthday present her mother Gayle Imm ever received. In 1980 Nicholas Imm (Nick) moved his wife Gayle, daughter Nikki and older sister Adelle to Arizona. At a very young age Nikki became involved with competitive swimming and track and field. Through her Jr high and high school years, Nikki filled her dad’s office with medals, trophies and other accolades. A quad accident left Nikki with a severely fractured arm needing screws and plates that ended her competitive athletic career. Nikki began college at Yavapai Community College in Prescott, Az. She transferred to Arizona State University where she received her bachelor’s degree. Throughout her college years, a burning desire to become a firefighter had begun to grow. After several unsuccessful attempts at various cities firefighter testing processes, while working for U-Haul, Nikki decided the best way for her to become a firefighter was to immerse herself in that lifestyle while continuing to test. On a Saturday in 1999, Nikki walked into Mesa Fire Station #1 to inquire about the testing process. There she met an engineer named Tim who offered to have her come ride along on his engine. Tim began to mentor Nikki in her testing. Nikki began working for Southwest Ambulance and directing everything in her life towards getting hired as a firefighter. 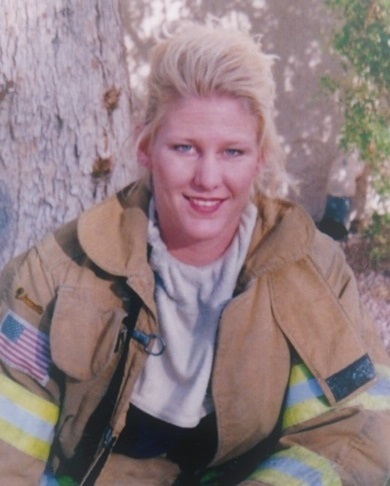 In August of 2000 Nikki was hired as one of the first 3 pre-recruits, a new position created on the Mesa Fire Department. During the next year she helped to develop the departments SOPs for the pre-recruit position and along with Brandon Guerra and Dave Montemora, she made the new position a success. The next year Nikki began her Firefighter Recruit Academy and in August of 2001 she graduated and began her dream career as a Mesa Firefighter. Nikki and Tim’s friendship grew over the years and led to them marrying in March of 2007. In September of 2012 they welcomed their daughter Abigayle into their lives. In 2014 Nikki was given the crushing news that she had breast cancer. She battled this disease for 5 years, the whole time believing that somehow she would beat it and God would deliver her a miracle. Nikki’s strength and courage throughout her battle with cancer will be a source of inspiration for her daughter and stepchildren as well as all of her friends and family. She is an amazing woman and she will never be forgotten. A visitation will be held Thursday, April 11, 2019 from 6-8 PM at Bunker’s Garden Chapel, 33 North Centennial Way, Mesa, Arizona 85201. Funeral services are Friday, April 12 at 10 AM at Sun Valley Community Church, 456 E. Ray Road, Gilbert, AZ 85296. I am so saddened to hear of this horrible news. Nikki and I were close childhood friends, she was so funny and did a lot of stupid stuff together. My prayers go out to all her family and friends. My condolences to Tim, Abi. And all of Nikki’s family and friends. She was an amazing woman. I got to know her when she was on light duty. Sweet, strong, and beautiful. She will be missed. I did not know Nikki personally, but I know the type. Working closely with these professionals over the 15 years I spent working in various EDs in the Valley, I have been blessed and know so many heroes and, in some cases, call many of them friends. I pray that God and the angels will help to ease the grief of Nikki’s family and friends. She will be watching over you always with her newfound angel’s wings. Thank you for your service Nikki and thank you to your family for sharing you with the citizens of Mesa!!! My deepest condolences to the family. God is close to those who grieve and wants to help them. (Psalms 34:18; Psalm 55:22) Please find comfort from his word the Bible during this difficult time. I am so sorry to hear the sad news. She will live on in your hearts and memories. God bless you Tim, Abi and family. Thoughts and prayers are with the family . Thank you “NIKKI” for your love of service to our community . May she rest in peace with GOD by her side for eternity .